Verizon customers with the Samsung Galaxy S6, Samsung Galaxy S6 edge, Samsung Galaxy S6 edge+ and the Samsung Galaxy Note5, are starting to receive the update that enables Samsung Pay on these devices. The mobile payment service was launched in South Korea during August. Following a successful month in that market, Samsung Pay landed in the U.S. on September 28th. Verizon is coming to the party late with the update. 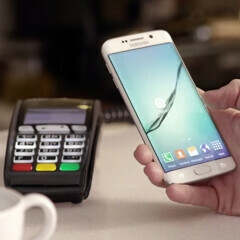 What sets Samsung Pay apart from the others like Apple Pay and Android Pay, is the fact that besides supporting retailers with a NFC enabled POS system, Sammy's mobile payment system also works with any retailer that has a credit card swiping machine that uses MST (magnetic secure transactions). This means that Samsung Pay is already accepted in 90% of retailers around the globe. However, we should point out that the only credit cards that work with Samsung Pay for now are Visa, Mastercard and American Express cards issued from major banks. The update sent out by Verizon also includes a security patch to prevent the Stagefright vulnerability from stealing content from your phone and taking control of the microphones and cameras on your device. At its peak, 95% of Android handsets were vulnerable, but with patches being send out to many different models for many different carriers, that percentage has surely declined. But there is some bad news. Even with the update being sent out, Verizon users still need to load the Samsung Pay app from the Google Play Store in order to use it. The problem is, Samsung hasn't posted the app in the store yet. Bottom line is that Verizon subscribers still need to wait before using Samsung Pay, even after they have installed the update on their device. Oh Verizon your the best network ever! I do think this kind anyone else said it wasnt. Many did say it should have been available from day one. I left VZW for this reason. I move 4 lines away. I have 2 devices left. But I will keep them on vzw, a Note Pro and Gear S. But once I get my G2, all will remain is the tablet. This is why I left u Verizon. I've been enjoying using Samsung Pay since day one. It's feels cool to get the looks, the questions and getting to show off. Works everywhere so far except gas pumps. But that may change one day. With Samsung Pay and Android Pay, I noon German need the carry a wallet. Samsung had no choice. Verizon blocked it. You can download the APK here... http://www.apkmirror.com/apk/samsung-electronics-co-ltd/samsung-pay-framework/samsung-pay-framework-01-16-0002-android-apk-download/ It works but once you load your cards, you have to verify your cards by entering a code that's sent to your phone or email that's on file with your carrier. After you verify the code, the cards show up as "Activation pending" so I'm still unable to use Samsung Pay. Hurry up Verizon! This was all done on my Verizon Note 5.